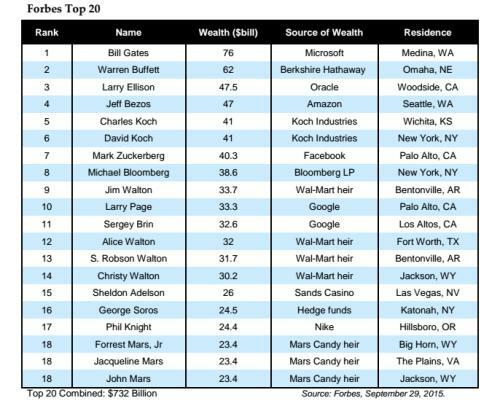 A report released by the Institute for Policy Studies on Wednesday found that the Forbes 400 list of America’s richest people have more wealth than 36 million US households, whose net worth is on average $81,000. Here is another way to put it: the 400 wealthiest Americans have as much wealth as the entire African-American population in the US combined and more than a third of the Latino population combined. The 20 people on top of the Forbes 400 list – “a group that could fit comfortably in one single Gulfstream G650 luxury jet” according to the report’s authors – own more wealth than the bottom half of the American population, which is about 152 million people. That’s about 57 million households or a population of 40 US states.